Honoré Mercier school was built in 1967 by the St. Leonard School Board to accommodate a growing French speaking population. It was given the name of the last nationalist premier of Quebec, Honoré Mercier. It became an English school within the Jerome Le Royer School Board in 1978. 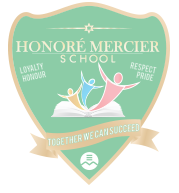 In 1998, Honoré Mercier became part of the English Montreal School Board. An additional wing was built in 1997 creating a total of 30 regular sized classrooms, a pre-kindergarten and daycare room, one resource room, an art room, a music room, a library-media center equipped with 8 computers, and finally a state of the art computer lab built in 2007 and updated every year. In addition, each classroom is equipped with a multi-media computer and linked through high-speed fibre optic cabling to a server and the Internet. Since 2012, all classes have Smart Boards set ups.